Paper workshops were held in Dobele Adult Education and Business Support Centre on 9-11 th of October. 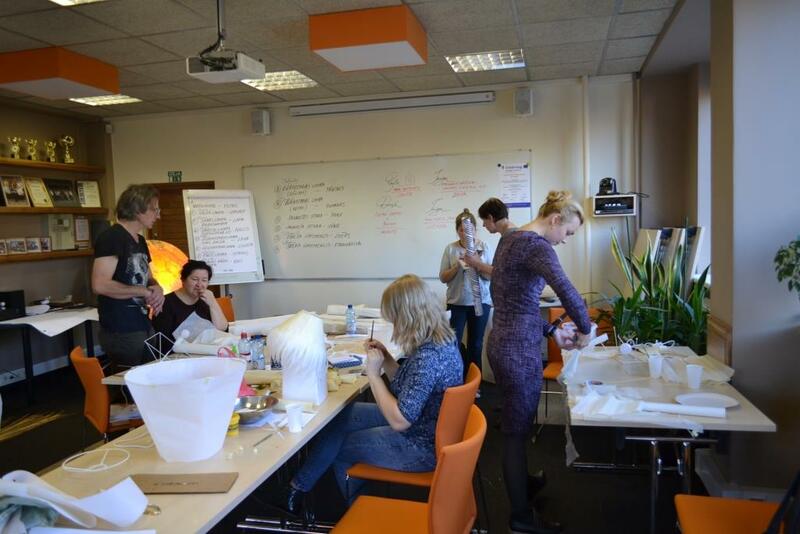 Interreg Latvia – Lithuania Programme artisans had practical creative workshops together with excellent experts Beāte Dronka and Ginta Šmite from paper design studio PURPURS “Dizaina papīrlietas” SIA. Together eight participants took place in workshops (4 from Lithuania and 4 from Latvia). These three days have been intense learning of design thinking and doing while working on ideas and design of paper lamps. Artisans created visual identity for their products and then learned about all kinds of paper structures and materials, who can be used to make the best visual identity and material assembly. Paper artworks will be presented at the final project exhibitions in Anykščiai and Dobele. This article has been produced with the financial assistance of the European Union. The contents of this article are the sole responsibility of Dobele Adult Education and Business Support Centre and can under no circumstances be regarded as reflecting the position of the European Union.